Our White Fluffy Bunny Badge. would be super cute for Easter. 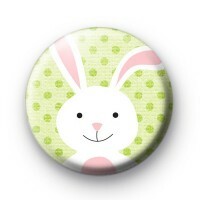 Kids love the Easter Bunny and this badge would be a cute little extra gift or for Party Bags. We have lots of Easter badges in the shop so if you need more designs then make sure you take a look at those too. They are the perfect thing for primary school teachers, parents to hand out to kids. They can be pinned to school jumpers and ties and allow you to have a bit of fun in class over the Easter period.